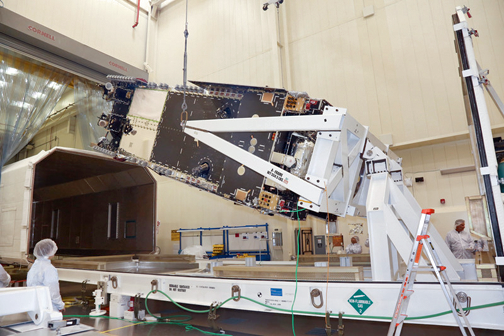 Lockheed Martin (NYSE: LMT) has completed the major assembly of Hellas-Sat-4/SaudiGeoSat-1 and has shipped the communications satellite to the firm's Sunnyvale, California facility to undergo critical environmental testing. The first of the modernized LM 2100 satellites, Hellas-Sat-4/SaudiGeoSat-1 is being built for Arabsat/Hellas Sat and King Abdulaziz City for Science and Technology. The satellite will provide advanced telecommunications capabilities, including television, internet, telephone and secure military communications to customers in the Middle East, Africa and Europe. Lockheed Martin technicians loaded the Hellas-Sat-4/SaudiGeoSat-1 communications satellite into its shipping container for delivery to environmental testing in California. Lockheed Martin technicians loaded the Hellas-Sat-4/SaudiGeoSat-1 communications satellite into its shipping container for delivery to environmental testing in California. Photo is courtesy of Lockheed Martin. Joe Rickers, Lockheed Martin's Arabsat-6G program manager, reported that the environmental testing is an essential set of activities to ensure the satellite can operate as designed in the extreme conditions of space and will meet customers' needs. Now that assembly of the Hellas-Sat-4/SaudiGeoSat-1 satellite is complete and environmental testing is on the horizon, that's one step closer to providing greatly improved communications capabilities for these customers.